QUESTION: The Democrats are trying to now demand a special prosecutor to replace Comey and will not accept anything else and are threatening they will stop the government until they get what they want. There is talk that this could lead to evidence of impeachment. Is that possible? ANSWER: Nixon was impeached because at the time Watergate took place, he was president running for reelection. It was the cover-up he engaged in, not the break-in. Even Obama stated that the vote was not tampered with so even if the Russian “tried” to influence the election, they were not successful. 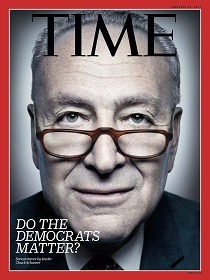 However, the disgusting tactics of Chuck Schumer are beyond belief. Even if we assume the Russians hacked the DNC and released all that info, there was NEVER any denial by the Democrats that the emails were fake, altered, or anything of a sort. So Schumer and the press are merely trying to prevent any reforms to the system whatsoever. Trump cannot be impeached unless he lies to Congress under oath. Bill Clinton did that and was impeached, but there was not a vote to remove him from office. They would need to reach that second criteria as well. I doubt the Republicans would vote for that, not because Trump is a nice guy, but they would set a precedent that would be very dangerous. Schumer has reiterated a Democratic call for the Department of Justice’s Inspector General to investigate the possibility of “political interference with the FBI’s investigation” into possible collaboration between Trump campaign aides and Russian officials to influence the outcome of the election in Trump’s favor. That is really absurd, since how do you measure “influence” when it is the DNC files that were the issue? Schumer embraced a proposal by Sen. Mark Warner of Virginia, the Democratic vice chair of the Senate Intelligence Committee, which is also investigating the Russian campaign connection, to try to block the confirmation of a permanent replacement for Comey until the Justice Department agrees to appoint a special prosecutor to oversee the FBI investigation going forward. Schumer does nothing for all the people being wrongly prosecuted in New York City. I wrote to him on people’s behalf and never lifted a finger. He takes money from all the bankers and protects them with every breath. He is just a fraud. This issue, nonetheless, will be used by the press to stop any economic reforms and the press is fully behind trying to prevent tax cuts. This is Trump’s stupid fault. It may now be too late to save him without some major distraction like a war. Trump is clueless that he is hated by the Deep State, Democrats, and the elite Republicans. All of them like everything as is – thank you very much. They view the people as cattle to be exploited. That is the sad state of government these days. It cannot get better – only worse.